We all know women are social by nature and love to run in packs. The Discover the Outdoors and Encourage Sportsmanship (D.O.E.S.) program provides an opportunity for them to experience nature in a pack. The Outdoor Recreation Adoption Model (ORAM) sheds light on the importance of social support – a necessary component when recruiting, retaining and reactivating (R3) individuals in outdoor activities. The New Mexico Department of Game and Fish had long ago ceased support of a nationwide women’s program, which eventually stopped operating altogether in the state. This left a huge gap in the women’s outdoor recreation social structure. In late 2016, the department sought strong partners to form a new, restructured program that would better meet the needs of today’s women. Answering the call, the Mule Deer Foundation (MDF) New Mexico, the Council of Outfitters and Guides, First in the Field and the department, developed and established D.O.E.S. as a new MDF-led initiative. During the first year the partners focused on establishing a strong committee of committed R3, hunting, shooting and fishing educators. Each committee member registered as official department volunteers and earned their hunter education instructor certification. The committee worked to establish the mission statement: to provide a field-to-table learning experience for women to encourage involvement in hunting, fishing, shooting sports and wildlife conservation. 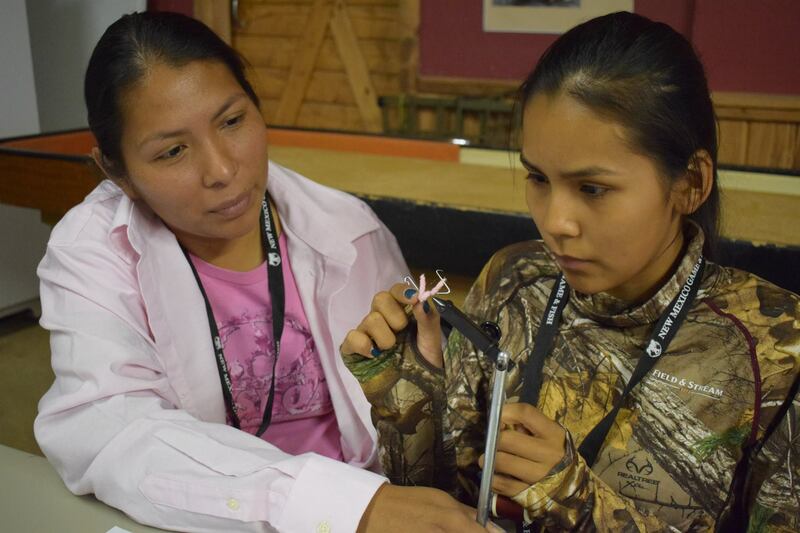 They also set a goal to reach 500 women per year to engage, educate and motivate them to participate in hunting, angling, shooting and conservation. The committee wrapped the year up by taking to the field and practicing their teaching skills amongst each other and a handful of guests. Beginning this year, D.O.E.S. opened the door to the public, marketing the program and attending outreach events to stir interest, all leading to the first camp. Booked to capacity, 20 ladies, mostly from New Mexico, traveled to Fishtail Ranch Outfitters in Chama, New Mexico. Located in in north central New Mexico, the private ranch provides private access to the Rio Brazos. After checking into the luxurious rooms, the air was alive with energy and excitement to learn something new. Most of the participants had never picked up a fly rod before and some were completely new to fishing. 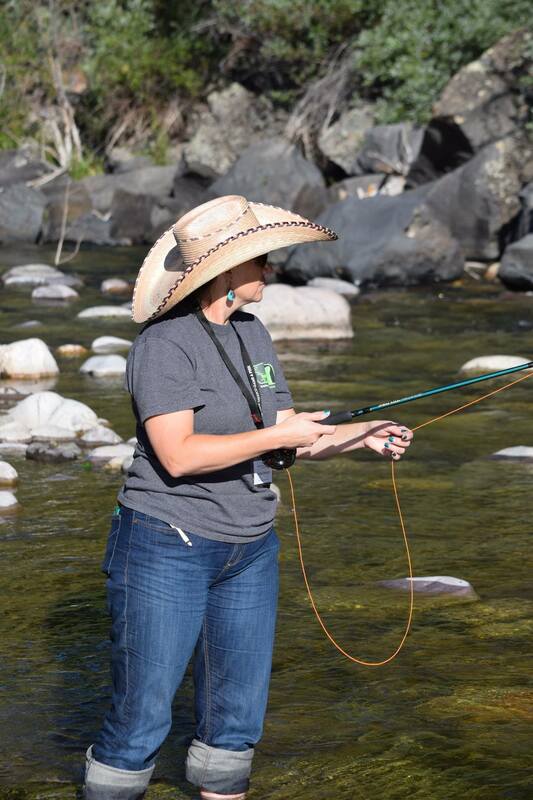 Ranch staff provided a crash course on the introduction to fly fishing in the horse barn. Everything from waders to fly rods, lines and flies were provided, and the group learned to tie “3 knots for everything.” They wrapped up their training, learning casting techniques and how to tie their own flies. The next day was all about the adventure. After a hearty breakfast, it was time to hit the river. Casting skills were perfected on the water. All returned to the lodge, filled with fishing stories and beaming with smiles. 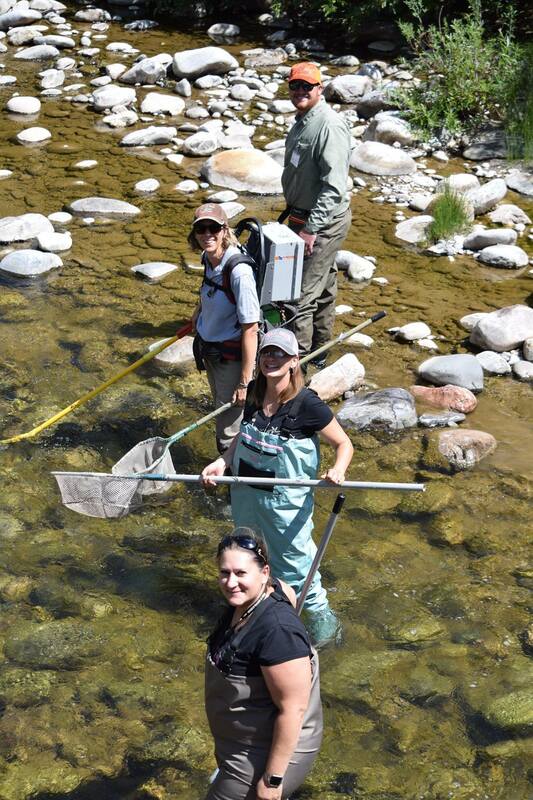 The department’s Colorado Basin native fish biologist, Jill Wick, provided a talk about trout in New Mexico. Jill then asked for volunteers to assist her in electro-shocking fish in the river below the lodge – this was a huge hit! The next morning produced the ultimate success story – one of the ladies caught a fish on a fly she tied the day before. It leaves you wondering who really hooked whom, but for the D.O.E.S. program it’s an obvious answer – there’s very little in this world more rewarding then catching a fish on something you create with your own hands. The group ended the weekend eager to take the skills they learned and return to waters of their own. To learn more about the D.O.E.S. program, contact Colleen Payne or Jessica Fisher.